I created a micro niche site around 3 months back revolving around a Clickbank product I've been trying to promote. After beating the bush around SEO for 3 months I tried Social Media Marketing where I have acquired some success. But I still am to obtain any success from organic search engine traffic. The website is based on a WordPress blog, I've done SEO through All in one SEO plugin. Submitted the website through quite a few website directories. Even after a thorough research on the main keyword on which my website is based, optimizing my websites performance for it to rank better, investing in PPC. I am yet to taste any success from SEO. Can anyone point out few problem that might be blocking out traffic and any solution to any of these problems? After reading your full post -- I have 3 Questions For you. 1) Did you do analysis Your competitor? 2) Do you Research? There is enough search for your KW? 3) How long your Article? Is that SEO friendly? I did, there is virtually no competitor for the exact keyword that I am targetting. Also I've chosen this keyword from Bing Ads after running a PPC campaign, so I am sure that people are looking out for this keyword. Also there are nearly 10 articles on the website, and are SEO friendly; h2 tags etc are used for headings and is mostly in accordance with the latest SEO trends, I was cautious about the SEO standpoint when I was writing these articles. Got my first Clickbank Sale within 24 hours from this Twitter Method. After struggling for 3 months with no success! Not sure if I missed it or not but I understand that you are trying to generate traffic to the website through the search engines. Did you build links to the site? What niche is the site in? Even if the exact match keyword phrase does not have a lot of competition, you still will need quality links to get the site to rank. PPC traffic should be good if you want quick traffic but make sure it converts or you will lose money. I have built backlinks by submitting the website to various website directories, nothing much I've done otherwise, regarding backlinks. I've spent enough in PPC, All I see is traffic till the budget hasn't been spent, after that there's nothing left. I would suggest to start writing blog content for your website targeting long tail keywords of your business niche. Choose trendy topics to write and add informative content with attractive visuals. If your content is unique and informative, it will give you traffic to your website and blog post will get placed in SERP. Build backlinks for that blog post using high profile Social bookmarking sites and social media site. Don't just stuff content in your blog post. Make it attractive to read and share. How do I build backlinks from high profile social bookmarking websites, what do you suggest? For now, the content that I got in my website is really good, and on-point. Here ya go! My Favorite #1 Resource of all time and it explains your question PERFECTLY! I hope this helps! It's full of OTHER great information too, so don't be afraid to dig deep within it for more knowledge! Donate Now: Help the Warrior Forum Come out of it's 3rd world state! Change the typeface from gray to black for better contrast, and increase the font size at least one size (12 pt for regular text, larger for headings and headlines. Make links really obvious - don't make people guess. Make your headings much darker, so they don't disappear into the page. In short, make your pages/posts as easy on the eyes as possible. That's not SEO which is why you're not ranking any pages. How is it not counted at SEO, could you elaborate? Afaik, this is what white hat SEO consists of. You're just listing things that have nothing to do with SEO. It's all social nofollow link nonsense and a plugin that does nothing. If you could just name a few other SEO techniques then, I can learn more about them from google. Just keep building links, doing your social media and posting new content. Is your article on page optimized? Have you targeted easier long tail keywords? Feel free to answer us these so we can help you more. It can really be hit or miss. I would get some SEO professional who has had proven long term Results. It will Cost but most things do. Hmm, I would first look at your kw and check your competition in Adwords again. Then I would decide on a few LSI KW to include in each article. Add at least a new article once per week. The plugin you are using is a pretty good one. When you write your title are you using a secondary title with kw in pipes? P.S. Even though you may not be on the first page of Google, are you getting any traffic from search? I am getting absolutely no traffic from SEO, swapping links is a nice idea, I'll get on with it.And I have created a fb, twitter account for the niche linking my website with it. Twitter is the only source of traffic; hence income for me right now. Are you writing your own content? I use to get at least 30 hits a day just using basic seo content. Of course that was after a week or two after publishing. You should be getting traffic from basic search too. I studied it and have re-written whole content in my words. Social Media Marketing isn't all you can do for increase your SEO score. You have to do other Off page and On page SEO techniques. You can also do Guest posting on high authority websites in your niche. Do some keyword research and make more and more quality contents. Do blog commenting. Hope it will help you. I am going to more guest posting from now on, also I've sought to try getting backlinks from authority sites by commenting, and article postings with back links to my website. Could you please give the URL? 3 months and no organic traffic? what are you using to analyze? Google Analytics? How much content do you have? ... has it been written over a period of days and not all published at once? ... is there new content being added regularly? is the content original? You're asking for help but aren't giving much to work with here. Last time I asked my doctor for meds but she wouldn’t prescribe anything without seeing me. Similarly, it's really hard to say anything for an expert without seeing your site. But, you're getting advises. Today, I know why did it take so long for me to become profitable. As a newbie, I was talking random answers from warriors seriously. Do you need an exclusive video product? Google analytics is what I am using to track, alongside Wp Jetpack plugin. I have around 12~ articles on my website with 2-3 static pages. And I had published the articles within few days and after that I haven't been adding much content to it, though the content is original only. Is the content unique in Google's eyes (even if it's completely original or not)? I have re-written the articles in my own wordings so I am sure that it must be original in the eyes of google. How about your domain? Is your domain deindex? If yes, no matter how hard you try for SEO, your site can't show on Google search and there will not be organic traffic enough. No, Its not deindex, as I have got very few visitors onto my site from google. And I have been regular in submitting and checking my website stats on webmasters. I am sure my website shows up on google, its just that its ranking really behind. Link no ~ 86. Far from being on the first page. What is a domain deindex? I'm fairly new here too. If it is the page/site in your signature I can see why. there is nothing of value there, it is just one sentence with an affiliate link. No no :'D not at all, the link in my signature is linking to the product which got me my first sale through twitter traffic on my website. The problem is that it just isn't getting any traffic from SEO. That's what I've posted here to get to know the solution of. Totally new here but I would suggest trading out All In One SEO plugin for the one by Yoast, and would also suggest increasing your number long tail keyword focused blog posts to at least 15 and adding at least 5 actual pages that are also long tail keyword focused. Be sure to link from internal pages to posts, or vice versa. Also, you shown use the Yoast suggest tool to come up with at least 5 more target long tail keywords. 1 isn't going to be enough - at least in my humble opinion. same is happening with me as well. Hope I will get some help from this thread. I've created one of my new website 4-5 months ago and so far I am generating organic traffic into it averaging to 163/day which is descent enough for a new site and I also started generating sales from ClickBank when I started to get involved again last month. Once in a while Iam driving paid traffic and it can hit 1000 hits per day as per below image. 1. Make sure to provide high quality content in your site. 2. You should have a good users continuity experience in your site. Start Your Breakthrough Journey. Design Your Future! Did you tried other strategies like Email Marketing,Media Outreach or Adwords? Been doing that from Hustle plugin for Wordpress, and the conversation rates are really less, for over 1000 form impressions, I've only collected 6 emails. These stats aren't good. I'd suggest changing your offer because either it isnt enticing enough or you aren't targeting the right people. Your keyword research will identify whether or not your search optimization effort will be a success or a failure. Many businesses make the mistake of basing their keywords on simply the search volume. This often leads to attempting to rank for keywords that are very difficult and costly to move up, or even keywords that are not “buyer” keywords and just send useless traffic to the website. There is absolutely no reason why your on-page optimization should not be perfect. It can mean the various between your website showing up on page three of the search results and your web site being the top listing. We encounter so many local businesses that simply ignore their on-page optimization. If the site in your signature is the one you are promoting, I don't see an email form anywhere. You need to research your keywords. If you can not do it, you can hire someone do it. This is an important part. I used to in your situation. After build backlink and gain 1st page of Google, my site get little traffic. I research the keywords again and I found my mistake of broad match and exact match. I changed to the exact match, after few months, I get enough traffic for conversion sale. A lot of people did not like PBN, but I still use them for my client projects. You need to get backlinks from various sellers, this will minimize the risk. You can also create web 2.0 backlinks (with good content) and build PBN to these web 2.0 properties. If you do nothing, you can not get traffic from Search Engine. Need Quality Backlinks: Check Out How To Buy Quality Backlinks in 2018? Can I make high quality backlinks myself rather than buying it from some seller? I've invested around $100 on PPC, didn't get any result so now I am a little reluctant spending more. How do you create web 2.0 backlinks? One last question about terms. What is PBN? And how do you build PBN to web 2.0 properties? What is an "aff" page in Bing? I'm fairly new and still learning my way around. I mean this in the nicest way possible, but GOOGLE OR BING SEARCH IT! You can also use the search feature in the Warrior Forum Itself - those are all things (all of your questinos) that have been covered, in detail, many times. My domain name is the keyword that I am targetting, exactly as it is. As others have said, it is impossible to say what is wrong if you do not want to give the address of your site. And I feel like you have a lot to learn about SEO too. First of all, the design of your website is not good. It is not inviting at all. And you should have a logo and a slogan. Secondly, you said that your keywords were exactly your domain name. So I "guess" your keywords are: home woodworking business. And I really do not see any page of your website that could perform correctly for one of these keywords. Did you try to find good keywords for your site? Did you place those keywords in google and looked at what websites appeared in the first page? Did you reverse engineer these websites? How is your website better or different from those other websites? The main keyword is what performed the best for me when I was directly linking to the aff page through Bing. So I assumed it'll work well for a microniche site too. I am going to target different keyword now. I don't use Bing, but is this a good search engine to use? And what is an "aff" page in Bing? I'm fairly new and still learning my way around. You afraid people are going to steal your NON success or something? Edit: Okay, you shared it - good! You may have to bring traffic to those articles to get them ranking. Try linking back from Reddit or LinkedIn Pulse to get some traffic coming into the site. I use the GENESIS Theme Myself and my sites look and convert amazingly well. Seriously, fix the theme - show excerpts of the posts like you're doing now - but make sure they look like individual posts, not giant Blue Links with small bits of text below them like they look now. As for your posts themselves, they just look like walls of text lumped together. Study some of your competition that's ranking where you want to be, study the products blog itself that you're promoting, see how they're structuring their blog posts. It's probably with good reason. You've got zero backlinks now, and zero traffic - you only have uphill to go from here so that's good. Invest in a Good theme, learn how to properly space out and format your content - make sure the posts on your homepage don't all just look like link bait (big blue h2 links for the titles) like they do now. Anyways, that's all the time I have now, but trust me - my advice here is worth money. Good job for taking action, now do yourself a favor and take FURTHER action by following the advice I just gave. I have already started making changes in the appearance, making it more professional looking. Also I had to edit the contents of the page. But I was just worried whether what is going to happen if I change the title of my post? Does it have any adverse effect on my SEO, because then google, will index two pages with the same content. I'll implement all of the advice there and see how it goes. I'll keep updating. I agree with what @TenaciousGrease have said in his posts so far. Good analysis on his part. Once the on page SEO is cleaned up, move on to off page SEO. Click here >>FREE Download "The Definitive Guide To Quora Keyword Research"
Remove All in one SEO plugin and instal Yoast SEO. You can find reason for that from www.wpbeginner.com . Create High quality backlinks to rank higher in search engine. Make your homepage a static page. Otherwise, every time you make a post, you're adding words (keywords) to the homepage and confuse Google as to what the page is about and what keywords to show your home page for. By the way, Product Debunked means product shown to be false, bad. Why do you think people are going to buy a bad product? As Yukon told you, you ain't done SEO. The plugins just check if you've used a the keywords in certain places... You need a bit more of that, especially backlinks, but, first, you need keyword research. On the page about Ted's 160000 dohickeys you have Neat and Tidy Presentation in h3. Why on earth would you have Neat and Tidy Presentation in title tags? That's where you put keywords you want to rank. In English, people read from left to right, top to bottom. That means the most important part of a page is the top and the left side. You put your best info there. But here only I was suggested not to keep it static as it looked like a big clickbait all together having a lots of links to the affiliate page. Talking about headings in the page, can you please tell me about what heading structure I should follow. for headings in the post I am using h3 tags and for subheadings I'll be using h4 tags. I am editing the heading tags of all the posts be in this format. Is this how it should be or it is wrong? But here only I was suggested not to keep it static as it looked like a big clickbait all together having a lots of links to the affiliate page.So don't put so many affiliate links on the home page. How about ranking many other pages? I was talking about the text in the h tags. Use well-chosen keywords in your titles. Is this how it should be or it is wrong?You should be using keywords, carefully selected keywords in your titles, in your h tags. I had a hard time changing the plugin once before in some other website. Are you sure it is a good idea that I change the SEO plugin? when i look at your site ranking, when it was registered and its layout, am sorry to mention that i personally think more work is need to be done. On all the mentioned aspects. First, for a rank in the search engine, you should build backlinks from authority sites first and be patient for about 6months. About the visual appearance of your site and layout, to me, i think you may better it by doing a small research about how your competitors did it. Then, remember that content is king. Write helpful and quality content, in 12months, we will await for your testimony. Yes I've been trying out various themes to check what works out the best. I think main reason of less conversion was the appearance of my website as it looked really unprofessional before. The current design is still better compared to the previous one so I've currently kept this, right now I'll focus more on generating backlinks and add more content to the website. Site needs some attractive colors , pictures etc. Some videos. At the moment it looks like a site done only for backlinks. You have zero backlinks. I don't see a problem with your niche, just put some energy into this site with some colors, pics, videos and backlinks. I am making it more attractive by editing posts and putting relevant pictures. Though I am having a hard time getting backlinks, I don't even know how exactly I should be getting quality backlinks. You really have to promote your website. Online Marketing is everything. Without backlink building for example, you'll stick with the "Publish & Pray" method. And with that, you'll get no visitors at all. I've promoted my website through PPC. But as soon as the Ads credit gets over its back to no visitors from Search engines. What do you exactly mean by promoting? 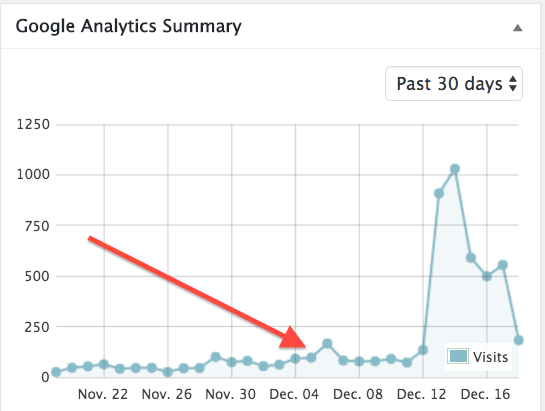 "Micro niche site" is a strategy that was working well like 5 years ago, not today. Why wouldn't it work today? Google pushed an update a few years ago that significantly reduced the ranking ability of very small websites. Before that update, you could make a 5 page site that was targeted at super long tail keywords, and rank for them. People would make dozens of 5 page sites and each one would earn a few dollars per day and they'd make a living off it. After the Google update, your tiny site is not going to rank very easily for anything. You will have to build real links to it to get it to rank. And building real links to a micro niche site that is long tail optimized is very difficult. In my opinion the best way to accomplish what it seems like you're after is to have a platform where you can write 2-3 articles a week, feeding the search bots articles that are tailored to the keywords you're trying to get traffic for. After 2-3 weeks of doing this you'll be getting organic search engine traffic. Be consistent and keep writing (and make it useful) or it's useless. 3 months is not a long time. You have to be patient and consistent. Here is the organic traffic for my blog. Notice it took quite a while to start getting any actual results. I'll be frank with you. Your website is not good: design, structure, content, etc. Nothing is valid. With such a site, all your promotional efforts are doomed to failure. Before promoting a site, one must be certain that it is really good. The days when it was possible to get to the front page of Google through tricks are gone. Look at the websites about your topic that are successful and try to figure out what they are doing. And then try to do better than them. On what basis you are stating that my content isn't valid? Other successful sites are doing exactly what I am doing as far as the front end is concerned. Mostly their domains are much more older than mine, maybe that is what makes a difference. Yeah most sure use social but have you commented on any blog or wrote any article? Just to name a couple! I redeemed a $100 coupon from Bing ads and let it run for a while. So for now I've stopped the campaign, I think some tweaks are required before I resume my campaign. How quickly a new website receives organic traffic through search results depends on the amount of time and effort put into not only optimizing the website but creating good content for it as well. Some websites see results after 3-4 months while some don't see results until nearly a year has passed. It also depends what market you're in - if you're business is in a saturated field it will be more difficult to rank for those highly competitive keywords. If this is the case, you will need to find a way to differentiate yourself and optimize for more reachable keywords. A very similar situation happened to one of my sites not too long ago. Fortunately, it was only down for roughly two weeks. The culprit? I was using Blogger and I accidentally selected the "do not follow" tab where the seo sidebar is. Will never let that happen again grrr. First of all don't waist your time by creating WP blog spending money around Clickbank product! One day this product go out of date or just be not available anymore. "I will send the traffic for you"
-Am I creating content around keywords that get a high search volume? -Is my content link worthy? -Am I creating content that solves people's problems? -Am I trying to game the search engines? - Proper Apply your Promotional Activity and Follow all Promotional rules and regulation. - Use High Density Keyword your site Promotion. - Use your site Short and Long Tail Keyword for your website promotion. - Follow Keyword Stuffing Policy. Write original content so don't copy paste in other website.